Retired--Now What? : Who Needs Livestock? Welcome back. Did you hear? The U.S. Department of Agriculture estimated the average American would consume a record high of 222.2 pounds of red meat and poultry in 2018. Here’s the question: Can we cut back on livestock in agriculture? 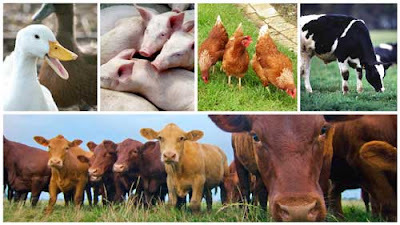 Do we really need all those farm animals? Livestock production is bad for the environment. Eating 222.2 pounds of meat is bad for our health. Should I go on? Maybe not, but I will or there’d be no blog post. Photo collage of US livestock. In my post on the World Scientists’ Warning to Humanity (Wake Up, World! ), one recommended step to sustainability was promoting dietary shifts toward mostly plant-based foods. To be clear, that was the scientists’ pitch for the environment, not human diet. A prime example of the reason behind that recommendation was provided in a 2006 report by U.N. Food and Agriculture Organization (FAO). The livestock sector was ranked as one of the top two or three contributors to the most serious local to global environmental problems. According to that FAO report, the livestock sector accounts for 70% of all agricultural land, is a key factor in deforestation and water use, plays possibly the lead role in reducing biodiversity and bears responsibility for 18% of greenhouse gas emissions (measured in CO2 equivalent), which was scaled down to 14.5% in a 2014 FAO report on livestock and climate. Regarding human dietary health, I’ll just point to the Dietary Guidelines for Americans 2015-2020, which recommends lower intake of meats as well as of processed meats and processed poultry. Most recent dietary guidelines for Americans. Researchers from Virginia Tech and the USDA’s Dairy Forage Research Center asked how food supply adequacy and greenhouse gas emissions would be affected if all livestock were removed from U.S. agriculture. 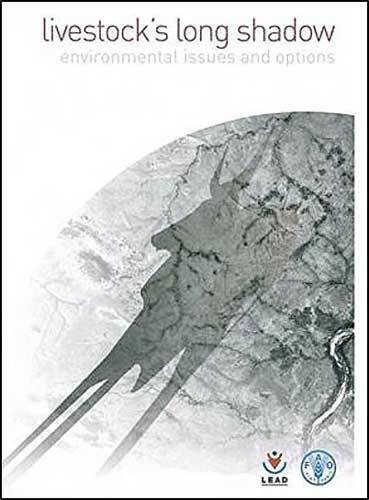 To answer that question and, in essence, establish the boundary condition for further discussion and research, they drew upon the best available data to quantify and model U.S. agriculture. Considering 39 nutrients (protein, carbohydrates, vitamins, minerals, amino acids, fatty acids), 36 of which are required to maintain life and health, the researchers determined that animal-derived foods currently provide energy (24% of total), protein (48%), essential fatty acids (23%–100%) and essential amino acids (34%–67%) available for human consumption in the U.S.
Their modeling showed plants-only agriculture produced 23% more food than agriculture with livestock; however, it met fewer requirements for essential nutrients. When nutritional adequacy was evaluated using least-cost diets, plants-only diets showed more nutrient deficiencies, a greater excess of energy and a need to consume a greater amount of food solids. Using published life cycle assessments to calculate carbon emissions associated with food production, the researchers estimated agricultural greenhouse gas emissions decreased 28% without animals. But this reduction did not fully counterbalance the animal contribution (49% in their model), and it reduced total U.S. greenhouse gas emissions by only 2.6%. 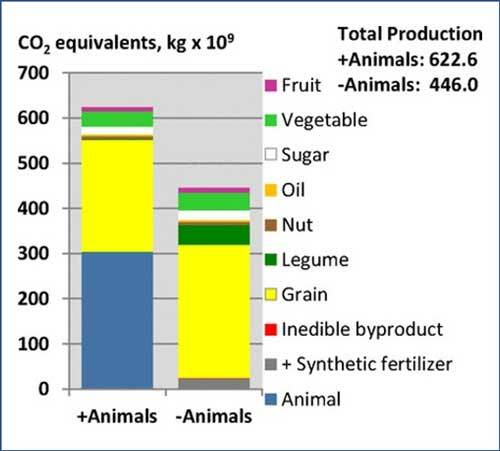 emissions with and without animals. Going beyond food supply and greenhouse gas, the researchers noted that the U.S. livestock industry employs 1.6 million people and accounts for $31.8 billion in exports. Livestock recycles more than 47.6 million tons of human-inedible food and fiber processing byproducts, converting them into human-edible food, pet food, industrial products and 4.4 million tons of nitrogen fertilizer. The study suggests that eliminating livestock from U.S. agriculture would reduce greenhouse gas emissions, yet the resulting food supply would be incapable of meeting the population’s nutritional requirements. Although the requirements of individuals can be met with plant-based diets, achieving that for an entire population would be a challenge, especially as regards essential micronutrients. 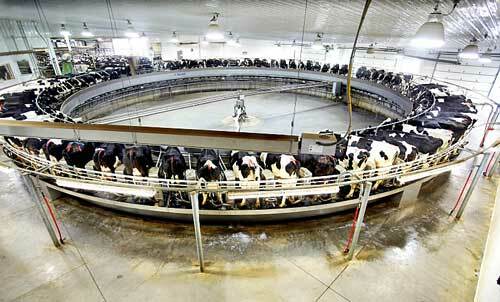 80-cow rotary milking parlor on dairy farm with over 8000 cows. Increasing the efficiency of livestock production is one alternative goal, but I also wonder if we might shift a bit toward one animal--edible insects. (Don’t gag!) As I described in my blog post Entomophagy, their nutritional value can be comparable to or better than meat and fish, and they emit fewer greenhouse gasses than most livestock, require less land and are much more efficient at converting feed to protein than conventional livestock. Think bugs, and thanks for stopping by.